The Exploding Head Syndrome is a form of auditory hallucination in which the patient experiences a loud bang in their head similar to a bomb exploding, a gun going off, a clash of cymbals, ringing, or any other form of loud, indecipherable noise that seems to originate from inside the head. In most cases, it occurs when they are in a state between asleep and awake. These loud noises are a common feature of out-of-body experiences. In surveys, as many as 85% of respondents indicate perception of them during the onset of such experiences. The etiology of the Exploding Head Syndrome is unknown, though some scientists have reported some correlation with extreme fatigue. This condition has also been linked to rapid withdrawal from certain prescription drugs such as benzodiazepines and SSRIs. 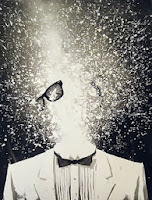 The Exploding Head Syndrome is a so-called parasomnia. These parasomnias are categorized into disorders of arousal (e.g. sleepwalking, sleep terrors and confusional arousals), parasomnias associated with REM sleep (e.g. nightmare disorder, REM sleep behaviour disorder and recurrent isolated sleep paralysis), and other parasomnias (e.g. sleep-related groaning, exploding head syndrome, sleep-related hallucinations and sleep-related eating disorder). Prevalences for the subtypes vary.